Yoko Ono Eats the Queen's Dog? Happiness ... is a warm, tasty Corgi dog, at least for one London performance artist. 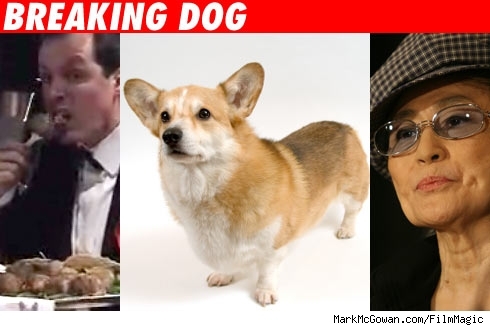 Ono was reportedly part of a canine-chewing stunt at a London radio station yesterday, reports Reuters, in which gonzo artist Mark McGowan ate cooked pieces of a Corgi, Queen Elizabeth II's dog of choice. McGowan staged the Fido-feeding (pictured above left) to protest the Queen's husband's treatment of a fox on a hunt last year. While the artist did his best to swallow a few chunks of Corgi (which had been minced with apple, onion and other seasonings), Yoko could only manage a small taste before looking "a bit strange," according to McGowan. Performance artist McGowan is a rabid vegetarian and animal-rights activist who once notoriously ate a swan to protest the monarchy. He says that the Corgi had died at a breeding farm. 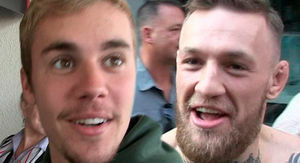 UPDATE: Yoko Ono's publicist, Elliot Mintz, tells TMZ that his client wasn't anywhere near London for the canine-feeding. He says the report about her is "untrue and absurd."